What is a Rhinoplasty Revision? You might require corrective or revision rhinoplasty for a number of reasons. Often, a patient undergoes corrective surgery to improve an unsatisfactory nose job performed previously. Emergencies can also happen and a revision rhinoplasty might be necessary after a broken nose. But, fear not, because you have options. In order to conduct a proper revision rhinoplasty, a surgeon must be delicate and precise. A procedure like this requires artistry and confidence, coming in after another surgeon’s less than stellar work and turning it into something you are happy with. After an initial consultation, we’ll come up with a pragmatic plan to feasibly achieve your aesthetic ambitions. What Happens During a Revision Rhinoplasty? Revision rhinoplasty at Beverly Hills Plastic Surgery Group can drastically improve the general appearance and bolster the shape and contours of your nose. It can improve nasal functionality in the non-visible parts of your nose. By and large, corrections will be made to the turbinates (bone tissue and cartilage within the nose that adapts the air we breathe), nasal bones, as well as the septum (which divides the left and right passageways through your nose). The end result is either a more definitely shaped nose, a better functioning nose as far as breathability is concerned, or a combination of both. * We can help remedy common problems and malformations, such as a deviated septum, poorly set bones or enlarged turbinates. These are problems that you might be living with on a day to day basis without noticing much. But once these problems are corrected, you won’t know how you lived under those circumstances previously. 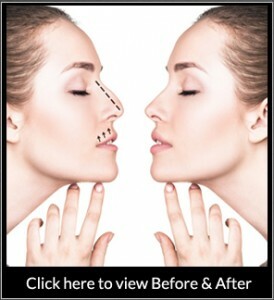 Contact Beverly Hills Plastic Surgery Group for your revision rhinoplasty in Beverly Hills, CA today. We’ll orchestrate a practical plan to achieve your aesthetic enhancement goals in a timely fashion. We look forward to working for you.